My favorite part are the big open pockets on the front. 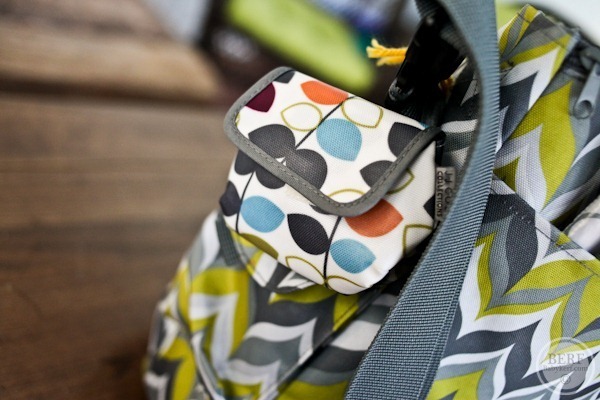 I keep my nursing supplies in them – my cover on one side and a burp cloth on the other. My water bottle is also always at easy reach. (The last thing I always need is my phone, which is often on my body or in the top pocket). I love that these front pockets are big enough to hold these nursing essentials and don’t have clips or zippers to fumble with when you have a hungry baby in your arms. 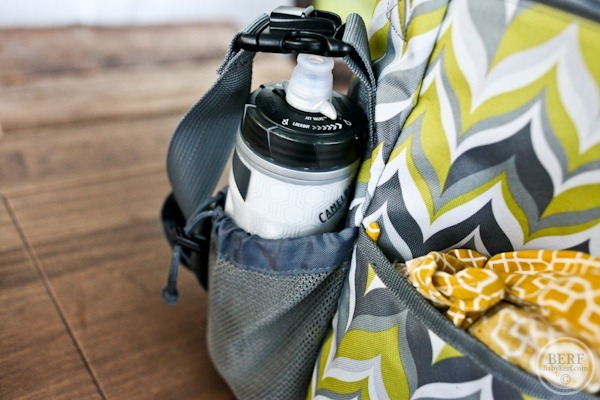 The water bottle holder fits both this skinny sport style AND my giant Camelbak liter bottles with no problem. Very happy with that! Nothing is worse than a too-small water bottle holder. Another item I always need to quickly grab: a pacifier. I bought this cute JJ Cole paci pouch on Amazon and it’s great for easy access. But most importantly, it’s great because when I’m leaving the house I give it a squeeze to ensure we have a paci on board. 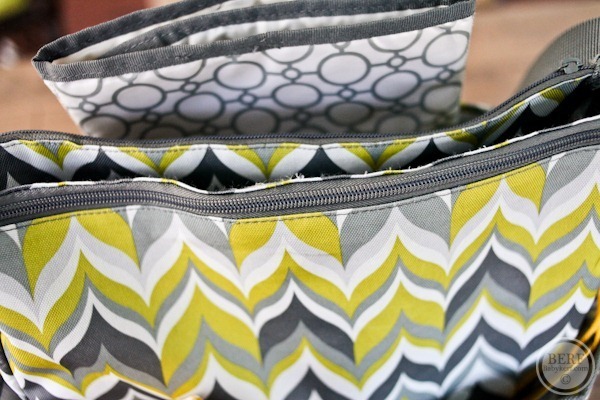 The Duo closes by magnet, which is also handy for not fumbling with zippers. I like the magnetic closure because it closes a little but not a lot – right in the middle of needs. 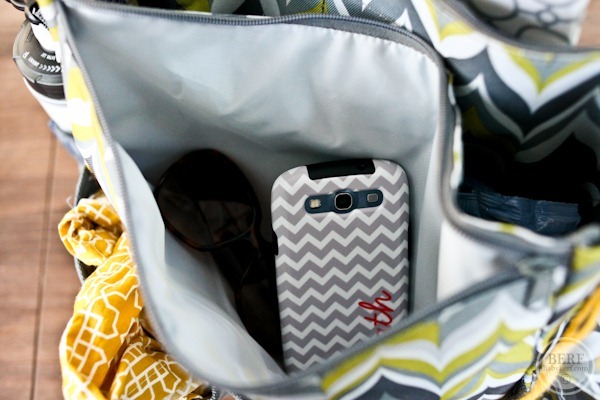 The zipper you do see is one of two short side pockets that I use for mom things – my phone, chap stick, hand sanitizer, keys, etc. If you fill them too full (like with my big wallet) they get bulky and it’s hard to get into the main pocket, so I use only thin things here. Great easy access though – especially when the bag is clipped to the stroller. The big pocket isn’t terribly roomy, but that hasn’t been a problem. When I put baby stuff AND my huge DSLR camera, it is very tight, but just baby stuff it’s fine. I would love to carry around a little bit more – cloth diapers are much bigger now that we’re getting into those, and we do have a change of clothes, but I wish I had more room for a spare jacket, hat, and blanket now that it’s getting colder. But those items would really stuff the bag full, so I’m going on the lighter side for now and adding things as needed when I leave the house rather than walking around fully stocked all the time. I love the little pockets on the inside for diapers and wipes – they stay out of the way of the main area that can get cluttered. We keep our change of clothes in the plastic bag that came with the diaper bag and also a Planet Wise wet bag for dirty diapers (although with disposable you can almost always find a trash can. I use the wet bag for cloth when we leave the house in those on occasion). 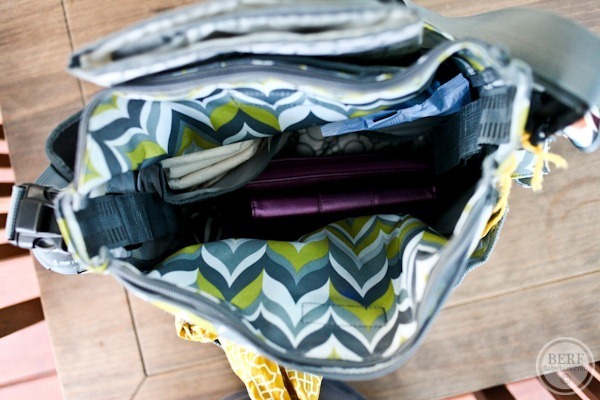 It wouldn’t be a diaper bag without the changing pad. Very stylish – no complaints! I love the shape and strap of the bag. I wear it messenger style most of the time, and Matt has no problem carrying it the same way. It’s a very comfortable, functional bag. And it’s holding up just fine. The only part of this bag that goes unused for me is the cell phone pocket on the side. It’s too small/out of the way for my phone and not big enough for much else. Although now that I’m thinking about it, it would be a nice place for the hand sanitizer! Lastly, it wouldn’t be Skip Hop without mention of the great stroller clips. They hide inside the bag sides and come out when needed. I can’t stress enough how nice it is to be able to put the diaper bag on the stroller so things are very accessible instead of down below. Coming soon: a review of a more fashion-friendly bag with just as many pockets! The paci pouch is actually jj Cole. I only know this because it is the pattern of my diaper bag. I always thought that bag would be a little small for cloth. I have the Jj cole satchel, and it is awesome! Any if you moms out there wondering about a bag big enough for cloth, this is it! My wallet, phone, sunglasses, keys, and Chapstick. My point: it’s a big bag, but it’s awesome. Even with all of that I have room to spare. I’m in search of a diaper bag. Good review. My phone fits perfectly (with extra room) in the cell phone pocket. I don’t have a cover on it (bad, I know) so that is probably why. I also have never used the stroller clips. I just hang it on with the regular straps (but that is because I haven’t figured out the stroller clips, LOL). 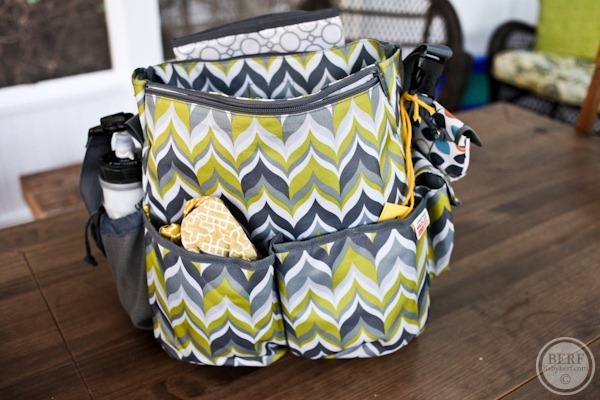 I love this diaper bag, though! 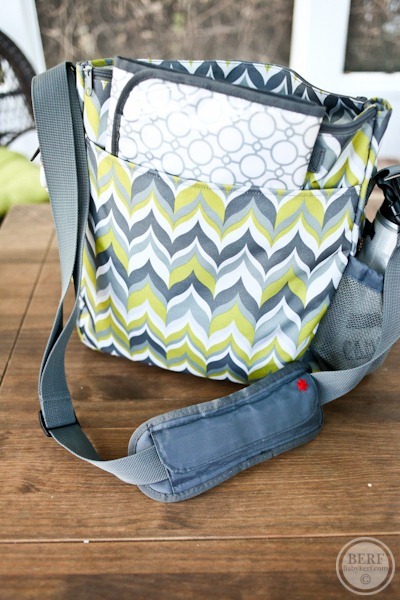 I bought mine when my 4th child was born and it’s my hands-down favorite of any diaper bag I have owned! Love it! You make me nearly want to get one even though I have no diapers to carry 🙂 Love all the compartments, my handbag could do with even a teeny bit of its organisation! I have that bag too (in a different color) and I put those Baby Mum Mum crackers in the phone pouch. So when Mazen is older a little snack might fit for him. When my daughter was younger, and we were out and about (and I had pumped before), a short Dr. Browns bottle fits ok there too. The flap stays open but that wasn’t a big deal for me for a shorter trip. 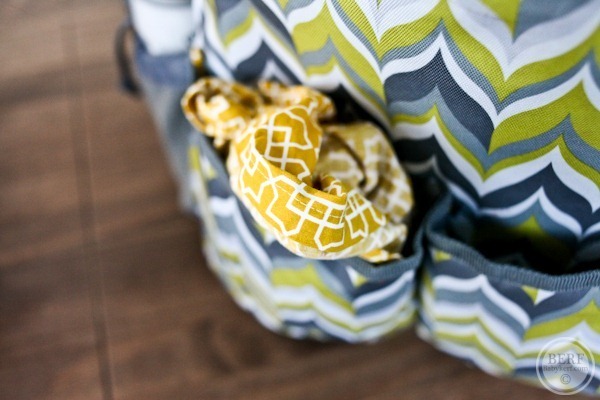 We have the exact same bag (same pattern too)! I use cloth diapers and just don’t bother trying to put them into the inner pocket (tho I did put the disposables there the first week) and just stuff them into the main area. We also use it as a way to cart his daily stuff from upstairs to downstairs every day, even if we’re not going out. Found in his bag at all times: cloth diapers and wipes, sprayer of wipe solution, wet bag, pacifier, burp cloth, nursing cover, aden & anais blanket, small ball for him to practice holding (it has cutouts, it’s mostly empty space actually…hard to describe, but lots of areas for him to grab, basically), soft panda rattle (lamaze), and high contrast ring to look at and hold. When we’re at home we also put a soft book in there that has high contrast on 1 side and animals with noises on the other side, and don’t bother to magnet it closed. When we go out and it might be awhile, I put a 4 oz bottle in the front pocket (I believe it has some cooler type stuff behind those front pockets, I remember reading that when I was picking it out), and we have the short, fat Avent Natural glass bottles but they fit fine. What do I put in that side pocket that’s supposed to be for cell phones? His hairbrush, haha. I put it there when we took him for his newborn photos and just forgot to ever remove it. I have a Skip Hop Bento. I love the pockets and the size, but the quality seems poor. I have a side pocket zipper that stopped working around 4 months. The shoulder pad is coming unsewn from the straps. I really wanted to love this bag but I don’t. Maybe I will have to check out the JJ cole Allison recommends. 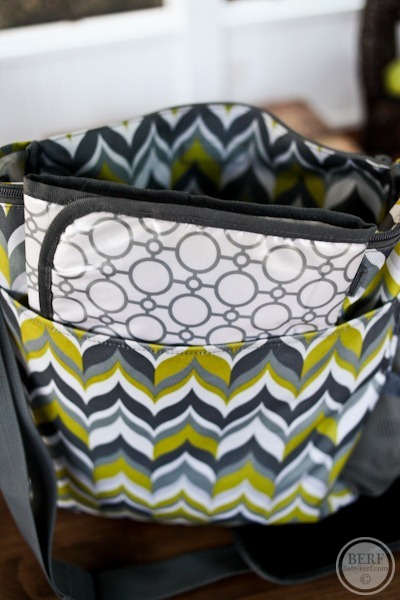 We also have a Skip Hop diaper bag (the Versa) and love it! However, I would warn against hanging your bag from the stroller – it is not recommended because it could easily tip the stroller over (especially when Mazen is still very small and doesn’t weigh much). I know Skip Hop and some other brands have stroller clips, but most stroller manufacturers will tell you to NEVER hang a bag (even shopping bags) from the stroller. I know on my City Elite stroller (which is exactly like a BOB), there is a huge warning label on the handlebar that says “DO NOT HANG BAGS FROM THIS BAR”. I would not chance it and hang anything from the stroller – especially if you are putting your heavy camera and other items in the bag! My Elite has a huge basket underneath that I store the diaper bag in and I just pull out my essentials (wallet, cellphone, keys, paci, a burp cloth) and put them in the little stroller console up top for easy access when we’re out and about. 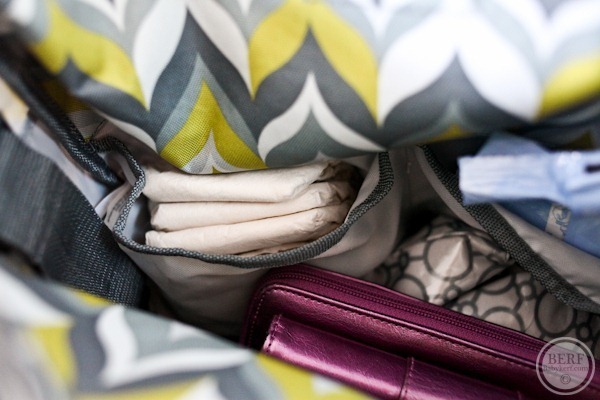 I never was a diaper bag person – and I’m a very type A organized person. Initially, we used an old backpack to carry diapers, wipes, changing pad, and a nursing cover. At some point in the early days, I realized the changing pad bottom folds in and it sort of grossed me out that it would transfer germs to the top — so I started changing the baby in the car if necessary. I started leaving an old towel to change her on (no messes occur when you put the new diaper underneath the existing diaper), a few disposables for just in case (we cloth normally), and a pack of wipes. There’s also some clothes – which I’ve yet to need in 18 months. Now, I have an 18 mo. old and a 2 week old and put all I need in my purse – I have a hobo style bag from Coach that has 3 departments — is 1 disposable for each kid, a travel package of wipes, and a small wet bag or ziploc depending on the day. I always have antibacterial wipes, hand sanitizer, and lollipops to survive errands with a toddler. My car has extras, I keep snacks in there as well, and of course, clothes. 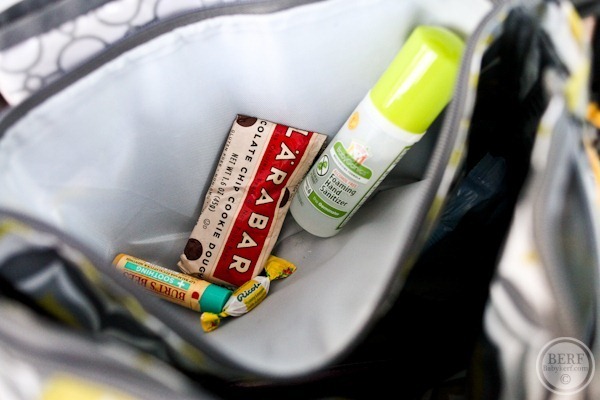 I keep a box of granola bars or nuts in there for myself and I always carry my water bottle. We never use pacifiers and for some reason never have done bottles which probably makes the need for a bag even less. If I feel the need to cover up for nursing, I usually have an Aden + Anais blanket which works. However, I usually feel like every time I try to cover up, it’s more hassle and I’m never entirely sure I’m covered. It’s easier to dress in layers and go from there. I think I’ve done better with a less is more approach – and I’ve yet to be in a situation where I didn’t have something. We never bought a “real” diaper bag (just used an old messenger bag that we had sitting around), and I’m glad because we switched to a regular backpack a few months ago when our baby started walking and it made a world of difference. SOOOO much easier when you little one starts crawling/walking everywhere and you’re at the park or out and about – I friend told me to try it out and I swear it’s like the big unspoken secret of moms of toddlers! It’s a huge pain to bend over all the time with a messenger-style bag and have it swinging around and get in the way, or else you have to sit it down somewhere and worry about it getting stolen or forgetting it, etc. And the older they get it seems like you need more stuff – snacks and sippies and extra clothes and of course still diapers and wipes, and I can easily fit all that plus my DSLR in my old college backpack. With a regular backpack, you don’t even notice you have it on while you’re running all over the place playing/picking up/roughhousing with your kid(s). But it only has two small outside pockets, and that’s a big bummer. My husband has a Diaper Dude that has a much better design. I have a skip hop bag that I love. I got it in black which has been great for my hubby. I love that their stuff is washable and all of the pockets are so deep!